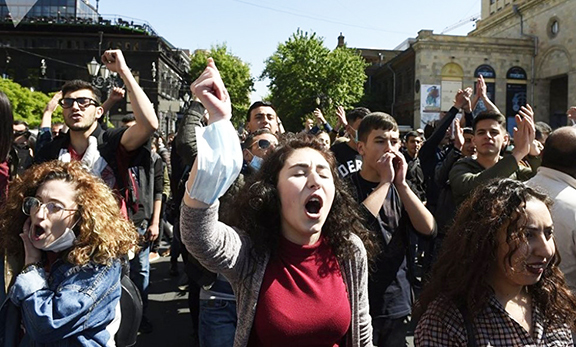 ALEPPO, Syria—The relentless attacks on the city have not deterred the students of the Sahakian and Zavarian schools from expressing their solidarity with their brothers and sisters in Artsakh and to take part in assisting them through their donations. On Monday, before taking their final exams, the students donating funds that they had saved from their daily allowances to the Artsakh. “This is the best expression of survival,” Jirair Reisian, a member of the Syrian Parliament and the spokesperson for the Prelacy of Peria (Syria) told Hayern Aysor. “Today, the children and youth of Aleppo, having felt the agony of constant bombardment, difficulties and living under a threat on their own skins, understand full well the effects of war and what it means to live in danger,” added Reisian. That’s the Armenian spirit, INDESTRUCTABLE. I bow my Head with tears in my Eyes.